Flourish! Suicide Prevention Initiative is holding a series of Training Days throughout the province in 2019/2020. Flourish! is a partnership between the Lighthouse Charity and clergy from throughout Northern Ireland. All sessions will run from 9:30am-4:30pm. Flourish! Suicide Prevention Initiative Training Days for clergy and representatives from churches of all denominations. 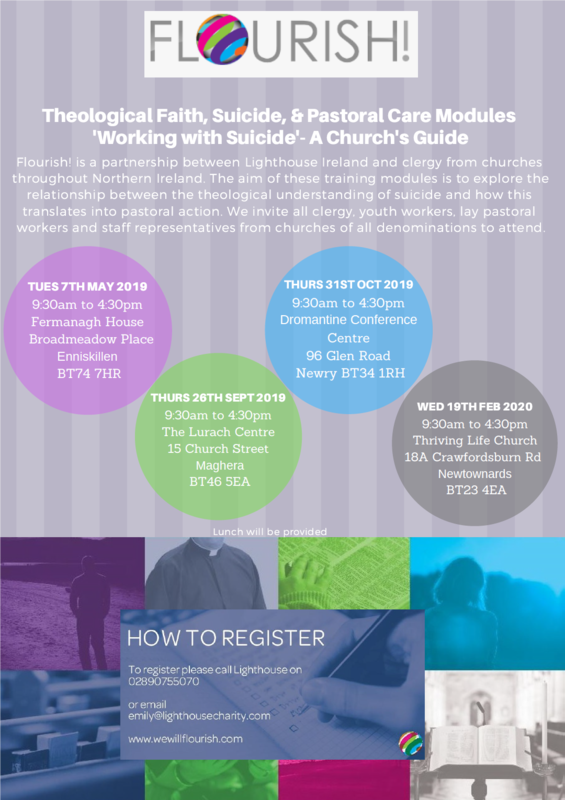 “The aim of these training modules is to explore the relationship between the theological understanding of suicide and how this translates into pastoral action. If you would like to book a place on one of the training days, please email emily@lighthousecharity.com to receive an application form. For more information about this initiative, visit the wewillflourish website here.